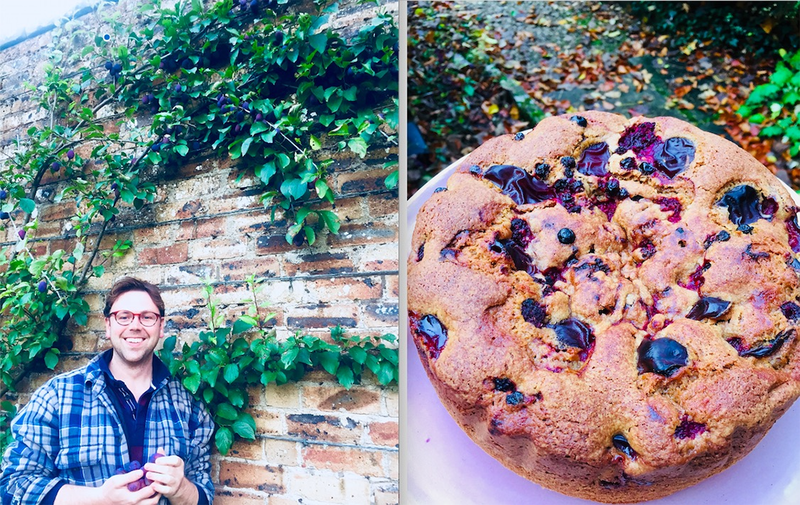 The formulation of this recipe was more trial and error than a regimented step-by-step instruction but it appears to have worked incredibly well. 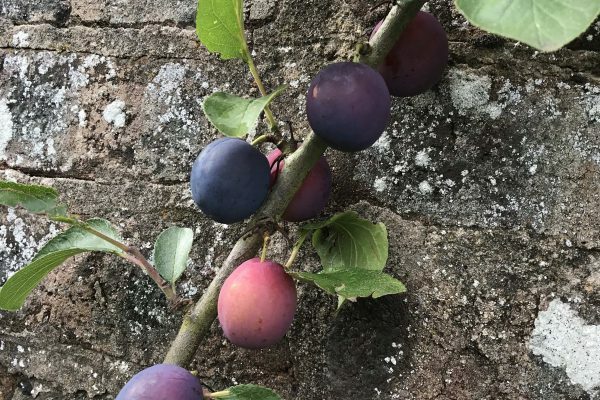 We have half a dozen establish plum trees here in the Walled garden and therefore a bountiful supply of plums. 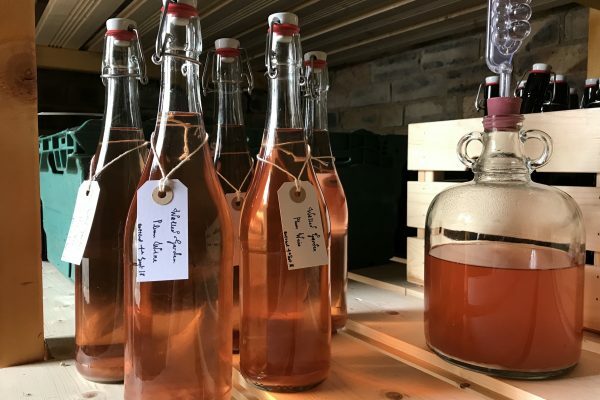 This recipe makes around twelve litres of plum wine and produces a beautiful Rosé coloured drink and a satisfying pop once bottled. 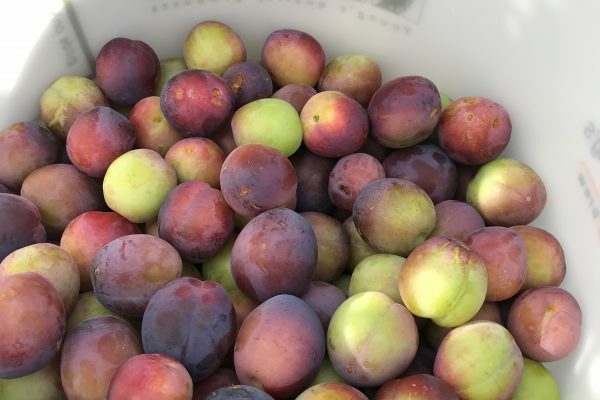 Step One: Wash the plums; discard any which are too soft, rotten or mouldy. Avoid using wind-fallen fruits. The process of fermentation relies on clean and sterile fruits and equipment. Step Two: In the clean fermenting bucket, crush the plums as best you can to break the skin and release some of the juices. I did this using a metal potato-masher, but use any utensil you have at hand (so long as it is clean – dip in boiling water for a minute or two to sterilise it). Step Three: Pour into the fermenting bucket 10L of boiling water. Give it all a good mix and pop the lid on the bucket. Store the bucket in a dark, warm space for three/four days. This allows the plums to imbibe in the water, releasing their sweet juices. Swirl the bucket everyday to ensure mixing. Step Four: Add 2kg of sugar, the juice of a lemon and mix. Then sprinkle the yeast over the surface of the liquid. It will float on the top. Allow it to sit undisturbed for ten minutes before mixing everything together. Step Five: Return the lid ensuring the Airlock is securely fitted. Leave the bucket in a warm, dark room for 3 – 4 weeks, swirling the bucket daily to ensure mixing. You’ll start to hear and see air bubbles coming through the Airlock when fermentation begins. Step Six: If you are looking for a dry, sparkling Plum wine bottle the liquid into secure bottles with a swing-top cap. The wine will continue to develop it is still a very active and young wine, the carbon dioxide produced through the slower rate of fermentation will provide a very welcome fizz in the wine and pop when opening the bottle. If however you’d prefer a still wine syphon into Demi-Johns with Airlocks. Rack the Demi-Johns for a further few months, keep tasting until you find the wine to suit your taste. 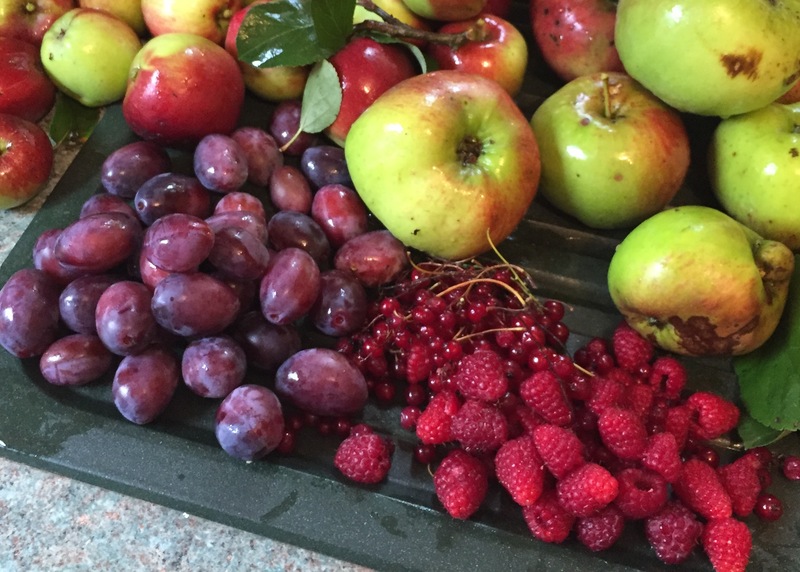 We all like to use the natural ingredients our local wild larder provides us. This month has seen an abundance of elderflower blossom at Teasses and in my opinion you can’t go wrong with a quick Elderflower Infused Gin recipe, something to enjoy on these long hot summer days. This recipe makes one litre of flavoured gin. Bottles of your choice – sterilised. Step One: Pour the gin and sugar into a gently heating pot. Allow the sugar to slowly dissolve into the mixture. Don’t boil. Step Two: Add the lemon strips and the elderflowers to the mixture. Be careful to ensure that all of the flowerhead are submerged. Step Three: Allow the mixture to infuse in a dark spot for up to 24 hours. This will allow the flavours of the flowers to develop. If you aren’t looking for a very strong elderflower taste adjust your timings to suit. Less infusion time will create a less pungent infusion. I tend to soak little more than overnight. Step Four: Strain the mixture through a fine sieve or cotton muslin and pour into your desired bottles. Put an additional strip of lemon into the bottle. This prevents the liquid from darkening too much. Once sealed you can store your Elderflower Infused Gin for as long as you like, but be warned the longer you leave it the stronger the taste. Be warned; natural yeasts on the Elderflowers can interact with any remaining sugars leading to further fermentation and more potent a concoction. Store in a dark place. Prior to serving allow your Elderflower Infused Gin an overnight experience in the refrigerator, as with most gin drinks, this is served best with heaps of ice and tonic water. The woods here at Teasses are abundant in Wild Garlic which rears its pungent head in March and continues to the end of the April. As the plant matures the strength of the flavour reduces so if you don’t want a fiery strong garlic taste then hold off until the second half of April. 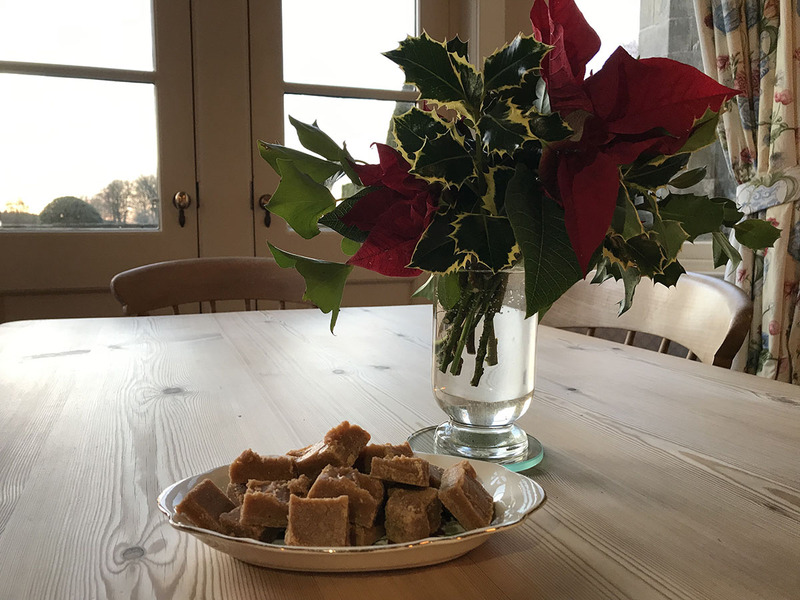 In this recipe I use the leaves of the plant but the flowers are edible too and can be used in salads or as. garnish on top of soups such as Sorrel or Pea. Unlike its namesake Wild Garlic doesn’t produce a bulb so you need to use it when it’s available. Note that if you intend to cook with the pesto – for example roasted Mediterranean vegetables coated in pesto – that the flavour becomes less powerful when cooked. I like to add another couple of tablespoons of the pesto once the vegetables come out of the oven, it also helps with the colour. This will easily make one large jar. a bunch of fresh, washed and roughly torn wild garlic – enough to almost fill a mixing bowl. 200g organic pine nuts – the more you add the thicker the pesto and less pungent the garlic. Step One: Gently heat a dry shallow pan, when almost too hot to touch throw in your pine nuts and lightly toast. 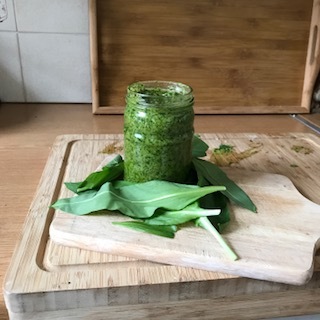 Step Two: In a food processor put the roughly torn wild garlic leaves with the lightly toasted pine nuts, cheese, a pinch of salt and the juice from the lemon and a little oil. Step Three: While blitzing the contents of the food processor drizzle in the remaining oil. Step Four: Continue to blitz until you are happy with the consistency. If it is too thick add some water. The best pesto is slightly chunky. Add more salt and some pepper to taste. If you want truly authentic pesto remove the food processor and pound the ingredients in a mortar and pestle. Once sealed in a clean glass jar this pesto lasts approximately one month when refrigerated or three months if frozen.